For hardscapes that are long-lasting and uniquely beautiful, stone masonry techniques have proven incredibly reliable. But in order to be effective, they must be performed with care and the finest craftsmanship. That’s why homeowners all over Northern Virginia look to the experienced team at O’Grady’s Landscape for projects large and small. 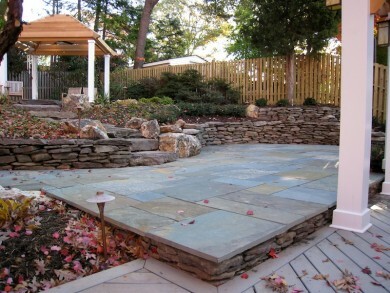 From walkways to patios to steps, you can count on us to get the job done right. Create a landscape design with a natural and inspiring look. Contact us today to schedule your consultation for stone masonry in Great Falls, the City of Falls Church, North Arlington, McLean, or Vienna! At O’Grady’s Landscape, we specialize in using stone masonry techniques to build lasting hardscapes with unique aesthetic charm. That means you can count on us to carefully plan and execute each detail, ensuring the end result blends in seamlessly with the surrounding environment and accomplishes your goals for style and efficiency. For assistance designing your stone masonry project according to your exact specifications, schedule your initial consultation today. We’ll come assess the scope of your landscape before offering recommendations and then seamlessly implement your ideas to accomplish all your goals. For hardscapes built to last and with an authentic look, trust in O’Grady’s Landscape stone masonry service. We have extensive experience using the finest quality techniques and materials to build custom structures, from stone steps to outdoor kitchens and everything in between, and have become the preferred choice for residential masonry services throughout Northern Virginia. Call today to learn why and we’ll help you build the picture-perfect landscape with stone masonry in Great Falls, the City of Falls Church, North Arlington, or McLean. You can reach us for an estimate at 703-533-5001!